Pollution (mainly from humans) around the world. BGA/Blue-Green "Algae", Cyanobacteria... evidence of a fouled (polluted) environment. Evident in waters near most all human habitations... from sewage, fertilizer, soil run off... Some species known to produce toxic metabolites, otherwise overgrowing, poisoning other life forms. Not always Blue... can be black, read... green... All slimy. Amongst the highest number of queries we receive for "HELP!" over the Internet, the presence and ill-effects of Blue Green "Algae" (henceforth BGA) ranks near the top. Indeed, I suspect that these noisome pests are responsible (in cahoots with the hapless aquarists who unknowingly kill off their livestock trying to rid their tanks of BGA) for the second largest cause of loss of captive life (and hobbyists in our interest), behind "ammonia" anomalies. For such simple forms of life, and so easily prevented/defeated… it's a shame that more isn't commonly known and done to thwart their proliferation in saltwater systems (let alone fresh, ponds, brackish…) Here's my take on what BGA are, where they come from, why you don't want them, how to minimize your likelihood of their introduction and multiplication, and what you can and should do to eradicate soon not-to-be-dreaded BGA. You may have heard of BGA's other name: Cyanobacteria… "Cyano" from the Greek meaning blue, and yes, they are bacteria… not real or "true" algae at all (images#….). In the (current) grand scheme of things in classifying living things there are more than just "plant" and "animal" Kingdoms that comprise living organisms. So what are algae, or better still, how can the algae be characterized? They're considered the simplest oxygen-producing life; algae are autotrophic (self-feeding), have no complex organization (no leaves, roots, stems, xylem/phloem vascular network); but do contain chlorophyll and other photosynthetic pigments. Algae are not, strictly speaking, true or vascular plants, by definition lacking seed embryos with their internal development and the structural complexity/division of labor of these "higher forms". Hence the Subkingdom of most algae (excluding the blue-greens which are actually more closely related to bacteria) is called Thallophyta, roughly meaning "all or about the same 'plant' body" in reference to the lack of specialized structures. The various Divisions (equivalent to the zoological taxonomic Phylum) of algae are classed on several criteria; pigments (by color we may generally identify them), storage foods, make-up of their cell walls and locomotory flagella, cilia where present. Though all algae contain chlorophyll, the major Divisions can for the most part be distinguished on the basis of their predominant apparent color, due to other photosynthetic pigments that mask the chlorophyll green. Division Cyanophyta- the blue green algae; often soft, slimy, slippery blackish smears or threads. Generally out-competed in well-maintained systems. Sub-Kingdom Thallophyta ("all about the same plant bodies")- the true algae. Division Euglenophyta- euglenoids; freshwater, marine, mud. Division Pyrrophyta- dinoflagellates; unicellular, get around via 2 flagella. Marine, brackish, fresh, sand. Includes Amyloodinium the "rust disease" that infects marine fishes. Division Chrysophyta- Golden Brown Algae. Division Bacillariophyta- Diatoms; silicate based exoskeletons, unicellular. Marine, freshwater and soil. Division Xanthophyta- Yellow Green Algae, mostly non-marine. Division Phaeophyta- Brown Algae/Kelp; marine, mostly littoral. About 1,500 species. Division Rhodophyta- Red Algae; mostly marine, about 4,000 species. 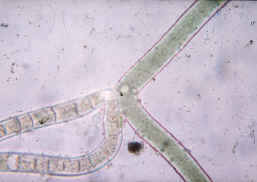 Division Chlorophyta- Green Algae; most freshwater, a few marine, some terrestrial. Kingdom Metaphyta- the true (vascular) plants; have leaves, roots, stems. Many species that aquarists encounter are microscopic, but there are filamentous forms occasionally seen that look a lot like green filamentous algae. Collectively, colonies generally appear as either blue/black or reddish covering slimes, smears, or filamentous threads. The following generalizations are, of a necessity, just that. As a rule BGA are attached forms that cover, loosely or not, rock, substrates, other living things, though there are some free floating forms that can be responsible for "green water" conditions. As you might guess, these "winning" life forms (they've been here much longer than most everything else) display tremendous environmental range and tolerance to change. Including such parameters as higher and lower pH's than "higher" forms of life (that do well mainly between 8.0-8.3); stable temperatures (in the low 70's to low 80's); ditto for specific gravity (1.023-1.025). BGA are euryhaline and readily adapt to inconstancy. Alternatively, as aquarists we should focus on providing "better" more stable conditions favoring the "true" algae. Their use of nutrients, light, and production of chemicals is the best defense against BGA problems. Be wary of poor filtration or water changing practices that leave your system with too much organic and inorganic source nutrient (or adding more through overzealous supplementation, aka additives). You want your nitrates to be low (less than 10ppm) and little phosphorus content (less than 0.5ppm), through water changing, periodic use of chemical filtrants, and uptake by purposeful beneficial algae taking up these dissolved nutrients. It should, must be stated that even given the usual measures of nutrient availability showing low concentrations you may still run into Cyano problems… they're actually fueled much more by DOCs, dissolved organic carbon compounds… hence the careful cleaning and use of a decent protein skimmer as a first line of defense, limiting DOCs in your water. And, ahem, where do these celebrated DOC's come from? Principally (over)feeding. Be especially leery of liquid invertebrate and gelatin based frozen foods… these are notorious sources of DOC. Besides water quality, the quality, quantity and duration of useful wavelengths of light are most important in determining the health of beneficial algae and by corollary, disfavoring BGAs.. Use of various types of regular, high, very-high output, compact fluorescents and metal halide lighting have all been employed with good success. A good rule of thumb/guideline might be 2-5 watts of lighting per gallon, very roughly, depending on species, depth of tank, and much more. Filtering water involves all we do to modify its make-up chemically, physically and biologically. This being stated, by doing your best to remove excess nutrients like phosphates and nitrates (through periodic use of chemical filtrants like activated carbon, keeping your skimmer optimally clean and operational). This is a key approach to BGA prevention as "higher" photosynthetic life forms are far more able to survive and outcompete Cyanobacteria at lower nutrient level concentrations. Cyanobacteria thrive in low circulation, poorly aerated conditions. Hence the call for vigorous water movement and near-saturation levels of dissolved oxygen. Providing powerheads, small submersible pumps, mechanical aerators and directing discharges from outside filters and pumping mechanisms are the best way to accomplish optimized circulation and aeration. Direct these devices to eliminate stagnant areas. Despite their best plans and actions aquarists frequently run into some Cyanobacteria problems, especially when their systems are going through initial cycling and settling in. There are a few appropriate responses to these situations, and one that is often employed that you should (and will) be advised against. Here are the suggested controls. Gingerly wiping the slimy colonies from the tanks sides, regularly removing the mass of the BGA from the gravel and or surfaces goes a long way to removing the BGA and their ill-effects. The bulk of the colonies out. Not only does this work directly in removing the BGA, but something in the way of chemical self-destruction is often triggered in removing the Cyanobacteria in this way. A small diameter rigid tube attached to a siphon hose works wonders. Being careful to make especially major nutrients like nitrates and phosphates limited is important. Be on your guard against overstocking and overfeeding fishes and invertebrates. Also, very importantly, be wary of putting in too much in the way of chemical supplements and to a lesser extent, chemical food from your tapwater and synthetic salt mix. Better foam fractionators utilizing ozone, preserving and increasing RedOx potential will increase desirable photosynthetic life and decrease unwanted algal forms growth. Practical chemical filtration can be of service in the pre-emptive removal of chemical foods. Unfortunately, other than some possible hermit crab species, there are no "clean up" crews, other animals to suggest that will regularly eat Cyanobacteria species on an assured basis. Instead, biological controls take the form of competing forms. Using macro-algae, live rock, and photosynthetic cnidarians (some of the gorgonians, corals, anemones) to utilize available light and nutrients prevents BGA proliferation directly. These organisms production of certain chemicals further combats BGA spread. There are numerous products promoted as chemical controls of BGA, some erythromycin antibiotic based, others of copper, sugars, even pepper sauce… All should be avoided on two counts: Though they (the antibiotic based ones) may apparently work, the materials that make up the BGA frequently poison the system within minutes to days of their "dissolving". And, adding insult to injury, unless you change the circumstances/conditions in your system, the Cyanobacteria very often "reassemble" in a short while if chemically treated. Blue-green slime algae growth should be avoided on several fronts. By way of limiting nutrients, through careful feeding of appropriate foods and limiting use of supplements, proper lighting, adequate filtration, circulation and aeration, and stocking of competing photosynthetic life. Should you have a massive outbreak of Cyanobacteria, look to the root causes detailed here and attack your BGA problems at their root causes: lack of competing photosynthates, overabundance of chemical foods, and stagnant, low oxygenated water. 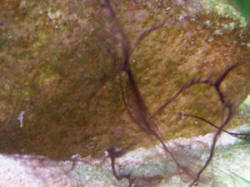 Beware of chemical fixes for these noisome algae types. They don't work in the long term, and may well poison your livestock in the short. Abbott, I.A. & G.J. Hollenberg 1976. Marine Algae of California. Stanford Univ. Press, CA. 827pp. Baugh, Thomas M. 1988. Caulerpa prolifera; an attractive species which does well in the marine (sic) aquaria. FAMA 5/88. Black, Tom & Alex Bielawski. 1971 Algae culture. Marine Aquarist 2(2):71. Blackburn, Wayne. 1989. Plants in the marine system. FAMA 7/89. Bold, Harold C. & Michael J. Wynne. Introduction to the Algae. Prentice-Hall, NJ. Brelig, Allen. 1993. Plants in the reef system. FAMA 6/93. Caribaldi, Lou. 1973. Seaweeds are not weeds. Marine Aquarist 4/(4):73. Colin, Patrick L. 1978. 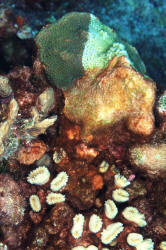 Caribbean Reef Invertebrates and Plants. T.F.H. Publications, NJ. 512pp. Dawson, E. Yale 1966. Marine Botany; An Introduction. Holt, Rinehart, Winston. NY. Dawson, E. Yale 1966. Seashore Plants of Southern California. U. of Ca. Press. Delbeek, J.C. & J. Sprung 1994. The Reef Aquarium. Ricordea Publ., Coconut Grove, FLA. pp 544. Dewey, Don. 1979. Marine algae; a key ingredient to the successful saltwater system. FAMA 8,9/79. Emmens, C.W. 1991. Algae. FAMA 8/91. Fenner, Bob 1989. Some notes on algae and their control. FAMA 6/89. Fenner, Bob 1990. 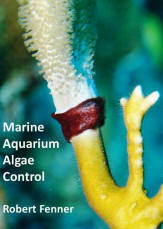 Macroalgae for marine aquaria. Pet Dealer 2/90. Fenner, Robert 1998. The Conscientious Marine Aquarist. Microcosm, VT. 432pp. Gamble, Sam. 1995. Algae curse: a new view. FAMA 8/95. Glodek, Garrett 1993. A lesson in plant taxonomy and systematics. FAMA 11/93. Glodek, Garrett. 1996. All you ever wanted to know about marine plants (selected bibliography). FAMA 1/96. Graff, Rick. 1993. Getting control of microalgae; how to deal with this problem in reef tanks. FAMA1/93. Hoff, Frank. 1988. Coral reefs of Florida, part II, the algae. FAMA 1/88. McGregor, Glenn. 1996. Cyanobacteria. FAMA 8/96. Michael, Scott 1995. All that algae; If it makes you feel any better, this is a common problem. AFM 8/95. Minor, K.I. 1995. What is that? Part V. Cyanobacters. FAMA 9/95. Paletta, Michael. 1990. Eliminating problem algae. SeaScope v. 7 Fall 90. Prasek, Ed. 1995. Mirror & slime algae; are they driving you crazy too? TFH 7/95. Prescott, G.W. 1970. How to Know the Freshwater Algae. Wm.C. Brown Co., Iowa. 348pp. South, Robin G. & Alan Whittick. 1987. Introduction to Phycology. Blackwell Scientific Publications. Wecsler, Lawrence H. 1975. Algae in the marine aquarium. TFH 2/75.